If I told you I was studying audiology, would you know what I was talking about? Most people don’t. They might have an idea of what it is (“something with ears?”), but there’s a lot to it! To be all technical, audiologists are the primary professionals who evaluate, diagnose, treat, and manage hearing loss and dizziness/balance disorders. In addition to prescribing and fitting hearing amplification, we can help with cochlear implant programs, monitor auditory nerve function, perform hearing rehabilitation training… and it doesn’t even end there! 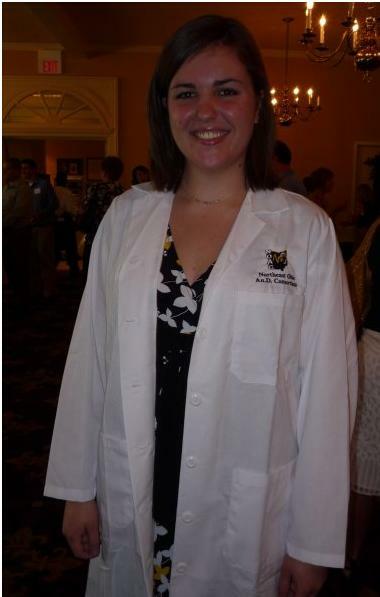 Right now I’m in my second year of getting my doctorate of audiology and love it. I thought I wanted to study speech-language pathology, so switched my major to speech and hearing in my sophomore year of undergrad. When I took my first hearing science class, I was hooked. How our ears work is SO COOL – that blog can come another time 😉 I finished up my degree in speech and hearing science in 2009 and am halfway through my graduate program. There are 23 students in my class, which is huge for audiology, but it’s great. We have spent a lot of time in the classroom learning about things like anatomy, noise, counseling, hearing aids, and research, but now that we are getting into clinical settings it’s becoming a lot more fun to do what I’ll be doing for the rest of my life! Our generation loves noise – we listen to music at concerts, through our mp3 players, on the radio… some people spend a lot of time mowing lawns or using other power tools, riding motorcycles, on the phone, using hair dryers… and these sounds can be dangerous. Over half of the 36 million Americans with hearing loss are under age 65 – and a third of those people have it because of noise exposure. It could be you! 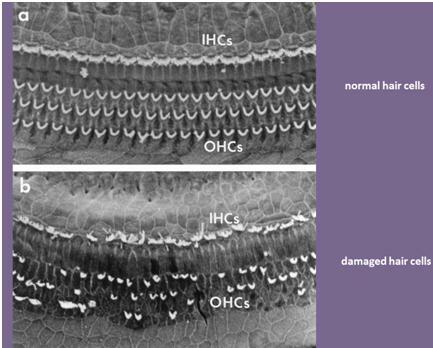 These hair cells are in the cochlea (the organ of hearing in your inner ear) – if you are exposed to loud noise, they will bend and break and won’t work – leaving you with hearing loss. BAD NEWS! 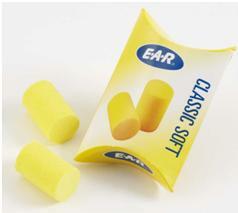 So, here’s my soapbox moment: PROTECT YOUR HEARING!You only get ONE set of ears. It is possible to keep them in good shape by wearing appropriate foam earplugs, earmuffs, or custom hearing protection devices when listening to sounds louder than 85dB for a long period of time. When you can, turn down the volume on your TV, mp3 player, and radio. If you can’t protect yourself either of these ways, just walk away from the noise. 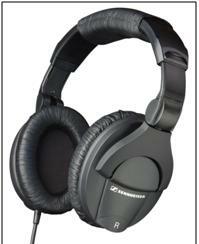 noise-cancelling headphones can work too! **Hollie is back for a second to let you know my noise canceling headphones are the best thing to avoid screaming babies on the airplane since the invention of birth control. How do you know if sound is too loud? If you have to shout to be heard, if the noise is painful or makes your ears ring, or if you have decreased or muffled hearing for several hours after exposure, you’ve probably damaged your ears. 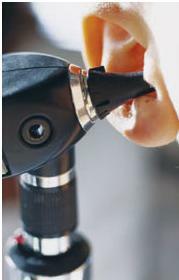 Hearing aids can help people with hearing loss, but won’t ever restore normal hearing. Don’t let yourself get to the point that you need hearing aids if you can prevent it! Untreated hearing loss can affect your ability to understand speech and can negatively impact your social and emotional well-being! « Girl Was a Diva and Needed To be Sent Home. I love learning about different degrees that are out there. Great post! My music is always up loud, but I do enjoy the quiet. I love when everything is still. This was such a cool post! I’m deaf in one ear thought to be caused from a virus so I try to be super good to my ears as much as I can. Thanks for sharing all this!